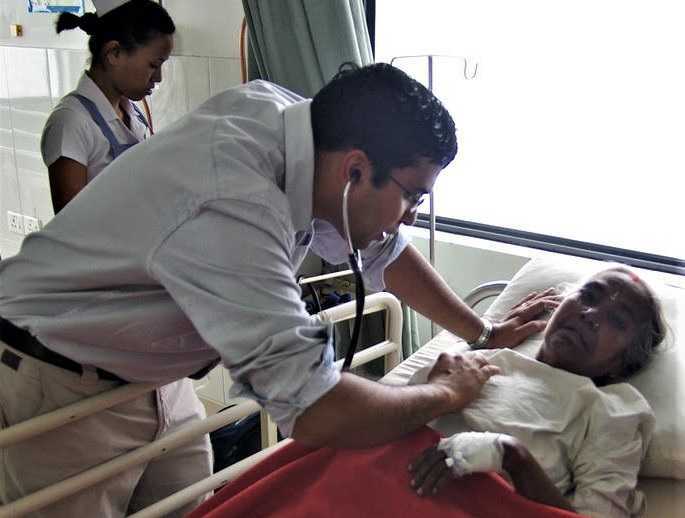 HYDERABAD, India (Morning Star News) – Emergency medicine doctor Christo Thomas Philip was returning with his family to his native India from a medical conference in Greece when immigration officials at Delhi’s Indira Ghandi International Airport took him into custody. His deportation from India on that day, April 26, 2016, came after working for three years treating destitute people on the verge of death from snakebites, HIV, diphtheria, tuberculosis and heart failure, among other conditions, in Raxaul, a remote area of eastern India’s Bihar state. He was planning to return to his work there at the emergency care unit of Duncan Hospital. At age 10 Philip had migrated with his family to the United States, where he was educated. He had a life-time visa to India and an Overseas Citizen of India (OCI) card, but the immigration officials confiscated the card and his passport, telling him only that he was no longer welcome on orders of the Consulate General of India in Houston, Texas. “It broke my heart to see my family from behind the cordoned-off section of the immigration detention centre. It was hard to watch my three young children crying, not knowing when they would see me again,” the Christian doctor told Morning Star News. His children were 11, 9 and 7 at the time. He recalled sitting in his seat on the flight back to Istanbul, Turkey, the transit point from which he’d arrived, tears filling his eyes as he watched India disappear from view through the window, he said. In Istanbul, officials locked him in a detention cell with 25 others for 24 hours, until he could board a flight to Spain, a prior transit point, the next day. From court records of the battle he fought for the next three years to regain his right to return to India, Philip could not detect who directed the consulate in Houston to order his deportation, he said. But he has not been the only Christian deported since Prime Minister Narendra Modi’s Hindu extremist Bharatiya Janata Party assumed power in 2014. His deportation was not an isolated case, as he became aware of numerous other individuals and families working with engineering organizations, hospitals or small businesses that were deported from India around the same time, he said. The failure to issue notices to the blacklisted Christians appears to have been intentional to prevent any type of judicial review since, once deported, they have limited legal ability to make legal challenges, he said. With legal advocacy group Alliance Defending Freedom-India (ADF-India) handling Philip’s case, the native of southern India’s Kerala state filed three petitions to the High Court of Delhi over the past three years seeking the reasons for his deportation. In response to a petition filed in 2016, the counsel representing the government submitted in court that the consulate in Houston cancelled his visa because he was found to be engaging in “evangelical and subversive” activities. It further recommended that immigration authorities cancel the Christian’s OCI card. In August 2017, officials passed an order under Section 7D (e) of the Citizenship Act that the cancelation of his OCI and lifetime visa was necessary in the interest of the sovereignty and integrity of the Indian subcontinent and its security and friendly relations with foreign countries, all in the interest of the general public. The order also cited involvement in missionary activities as the reason for Philip being blacklisted, preventing his re-entry into India. The High Court permitted him to challenge the August 2017 order. But immigration authorities and the ministry of foreign affairs rejected the application, claiming he was involved in missionary and evangelical activities, and that he had suppressed his real purpose of conversion activities by carrying out medical work. The officials said he was responsible for acting against the interest of general public, causing unrest and law and order problems. Aggrieved by the narrative built against him, Philip through his ADF attorneys filed the third petition. Last month High Court of Delhi Justice Vibhu Bakhru ruled in a 23-page judgment that two matters had to be decided: First, whether the consulate had any reason to require the cancellation of Philip’s rights “in the interest of sovereignty and integrity of India or in the interest” of the general public; and second, whether engaging in missionary activities in India was against the law. The court called on authorities to produce all relevant materials that had led to the cancellation of Philip’s OCI. Government counsel Rajesh Gogna submitted a one-page report asserting that Philip was born in the United States, was registered with a U.S. missionary organization, was practicing medicine at Duncan Hospital in India and that he violated rules prohibiting missionary activities by OCI card-holders. The report also expressed doubt that Philip had obtained a license from the Medical Council of India, although he had obtained one in 2014. The court stated that the report contained untruths and requested that authorities submit the materials on which the assertions were based. In response, immigration authorities, embassy and Houston consulate officials and the Ministry of External Affairs submitted printouts of blogs posted on the Web. “The blogs only contained his experiences serving at Duncan Hospital and had no solid evidence suggesting Christo’s involvement in any activities that are regarded as against the nation’s interest,” a legal expert told Morning Star News. No evidence or reports on investigations carried out against Philip that were submitted to the court were revealed to him, as he was accused of putting the integrity and security of the country in danger, the source said. “The matter was highly confidential, and he was treated like a criminal through this entire episode of deportation,” the source said. On Jan. 8, the High Court in its ruling reminded the government that India is a secular country and that all persons therein have a right to practice their faith as they wish if it does not offend other people. The three-year legal battle thus came to an end as the High Court of Delhi set aside the consulate orders, directed officials to restore Philip’s OCI card and instructed them to ensure that there is no impediment to his entry into the country. He added that his faith is what compels him to serve his fellow man, and that he was privileged to get the opportunity to do so through medicine. Still residing in Texas, Philip told Morning Star News that it is his dream and desire to return to India. Since being deported, he and his wife have adopted six children between the ages of 1 and 8, in addition to their three children, he said. The High Court verdict is a landmark judgment protecting the rights of foreigners working in Christian organizations to freely live out their faith in India, said ADF-India Director Tehmina Arora. “It restricts the arbitrary action of the Ministry of Home affairs targeting foreigners merely because they are Christians,” Arora said. The administration and police need to ensure that no one is targeted for their faith, and that everyone is able to freely exercise their fundamental right to practice and propagate their faith, as protected under the constitution of India, she said. ADF-India recorded 292 cases of hostilities toward Christians in India last year. India ranked 10th in Christian support organization Open Doors’ 2019 World Watch List of countries where it is most difficult to be a Christian, up from 11th the previous year.